This photo to the left is from the Hotel Montana in Haiti, the room I stayed in last March. The room was a junior suite; I received a free upgrade because of the availability. The bar behind the sofa had a mini fridge where I stashed my bottled water. 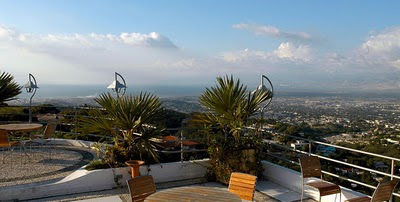 The room was in the back of the hotel, overlooking the mountains of Petionville. We always stayed in this hotel because we had a discount rate, had stayed there for years because it was safe. Until the earthquake of Jan. 12, 2010 when the hotel came crashing down. I've never stayed at any other hotel or guest house during the 16 years I've visited Port au Prince. I've gazed at sunsets from the terrace of my hotel room, stared at the one-room shacks peppering the mountainside, gazed down at the darkness of Cite Soleil while dining on the terrace. I'm home today, trying to write the newsletter article that is due next week on our special Haiti earthquake edition. It's in first person. I can't write about this tragedy without it being in first person, because for 16 years, Haiti has been part of my life as much as my husband, my pets, my home. I found a chilling diary entry from 2008, when I was in Haiti... the week of Jan. 12. The post was written at the Hotel Montana, right after I finished dinner. The table was the "prime" table on the terrace, overlooking a vista of the city. The wood slat chairs had metal legs that screeched along the Chattahoochee when you pulled out your seat. Palms and ornamental foliage filled the planters lining the terrace. Inside the restaurant were quiet reflecting pools and a waterfall, with bright pink bougainvillea. White floor to ceiling drapes were tied back in a very open air atmosphere, but they closed the French doors when it rained. In this photo, the table is just above to the left. Ed, the photographer I had traveled with that trip, had just left. "I'm gazing at the lights below of Port au Prince. Candlelight flickers on my table. Four torches on a distant mountain remind of a medieval castle, a step back in time in Haiti. Like Haiti, I have to take a step back and reflect and slow down and search inside. I know I won't ever forget the weary eyes of a 22-year-old mother carrying the weight of her malnourished son in Cite Soleil... I talked with the old man here at the Montana who runs the gift shop. He asked about Catherine and I told him she was coming here to meet with me, and just chat. Then a little while later, I was in the News Bar, waiting for her and guess who shows up at the same time Catherine does? The old man who runs the gift shop. They laughed and chatted a little while I sipped my Sprite at the bar. Haiti's like that. Everyone knows each other, it's like a large extended family where everyone at the News Bar, like Cheers, knows your name." The News Bar with its red and white stained glass sign above the mahogany counter is gone. Msr. Laurent, the head barman who usually poured the drinks, is dead. This is the Hotel Montana now, as I visited it last week. The entire top floor caved in, crashing to the ground and covering the lobby and ornate circular entrance way like a coffin lid. This photo is of the village shops and apartments. The doorway to the far right leads to the makeshift morgue. I think about those who were in the wrong place at the wrong time and never made it. The woman we saw in the crushed car downtown. The parishioners at the Cathedral trying to flee who were trapped in the doorway by concrete raining upon them. Those still missing at the Hotel Montana. I say little prayers, because in a way I'm too numb to pray in earnest. I pray for their families, their loved ones, their friends, for grace and strength. I pray for Haiti to heal and recover. I haven't talked about the Montana much until now, because of the rescue operations and out of respect for the families of those still waiting for news. I realize I need to write about it now, because I also need closure. Images of the hotel as it was are burned into memory. The tiny, coffin like elevators that had mirrors and small fans. The button for "lobby" was a silver upside down "7." Like everything in Haiti, the people cleverly improvised when they had to do without. The bricked steps leading to the first floor, where the original reception desk was, and later it was turned into a little bakery where you could buy pastries and croissants. The white stained glass model of a church that sat on a small side table by the French doors leading down to the big mahogany tree and the pool. The shoeshine man who sat beneath its shade for years. I remember passing him after breakfast the last time I stayed there and saying a cheerful "Bon Jour." He always had a beaming smile. Jude, the waiter I've known longer than anyone else at the Montana. "Pomme frites" or "riz?" His wife had gotten into a nasty car wreck last year but she recovered. Is Jude alive, or dead? I don't know. The polished wood banister of the staircase leading to the second floor, where I've stayed so many times, and the curved steps leading to the top floors. The gold ornate mirror in the second floor hallway that always showed how tired I looked after a week in Haiti. The heavy wood doors once had old-fashioned keys and locks. They gave you your key with a keyring with a large oblong piece of wood. I once joked with Gina, our photographer, the Montana key rings would make good weapons. You had to leave them at the front desk so the maid could clean your room. The terraces and open air alcoves that offered privacy and quiet retreats with reading lamps. The downstairs lobby with its mirrors and the reflecting pool with pink bougainvillea. I sat there for 45 minutes last March waiting for our ride and that's when I decided to write my Nocturne Bite using Haiti as the setting, only name it a different island. The hotel featured in Darkness of the Wolf is the Montana. The stone statue of the mother hugging her child used to flank the Montana's lobby entrance. I did visit the Montana last we ek. There was a hushed quiet in the air, broken by the murmur of voices and the sudden barking of German Shepherd search and rescue dogs caged for the night. This photo is of the last sunset I'll see at the Montana, the sun setting over the remains of the village shops. The tarp strung up is to give some privacy for the search and rescue teams to shower off the dust and rubble after they finish. The sky streaked ribbons of purple and rose as we studied the names of the victims who were identified, and the missing, a Chilean flag perched above the poster boards. A candle flickered on the table where a woman was working on paperwork. Then there were the grim visages of the Chilean police investigation unit, donning haz mat suits as they prepared to go into the makeshift morgue to ID the bodies of those already found. The stench of dust and death lingered in the air. I still have reservations for January 25, the day I was to arrive at the Hotel Montana. We'd discussed visiting Haiti earlier in the month, but decided against it. How close would we have come to being there Jan. 12 when it all came crashing down? We wouldn't have been at the Montana that Tuesday, but in Jacmel, in another hotel that also collapsed and was destroyed. I don't know why these things happen. I can't even begin to try to understand the why. All I can do it forge ahead, say prayers for those who lost their lives, strength for their loved ones and family, for those still in Haiti who struggle even harder now with daily life, and try to help as best as I can. And maybe, some day, be able to look back at Haiti and my time there, and all my visits to the Hotel Montana, the sodas poured by a busy Msr. Laurent, the memories and the thoughts of those who were there to help Haiti and died in a hotel that was the best in Haiti, and not feel this knife like pain in my chest. I know it will be a long time before I can forget the Hotel Montana. When I walked through the tall metal gates for the last time, they creaked slowly shut behind me, closed by a Chilean soldier shouldering a rifle. The Montana is no more. God bless all those who perished in the earthquake of Jan. 12, 2010, and all those who lost a loved one, and those in Haiti struggling to live on. Sunday we toured downtown Port au Prince. It was sobering and chilling. The level of destruction is staggering. It resembles a war zone. Buildings smashed like clay pots, giant concrete slabs simply dropped down upon innocent people who just happened to be in the wrong place. A woman in a car, a bottle of cod liver oil capsule by her hand. A man on a bicycle. There is so much destruction that dead bodies that can't be easily extracated still remain. Children inside homes. Worshippers inside the Cathedral, caught in the rubble, trying to escape. This photo is of a man who survived who is now trying to survive himself. He's scavenging from the remains of the St. Vincent de Paul home for the Handicapped, where 7 kids died and many were injured. Sunday I got hit by a motorbike. It was stupid of me. I was by an elementary school that had collapsed, probably with kids still inside, the same elementary school where one of our staff went to school. I was walking across the street. I didn't hear the bike because he was coasting, which was good because I got a huge bruise that only bled a tiny bit. The fear on this guy's face was horrifying. A gush of Creole spilled out as he apologized, and I just told him, "It's okay, it's okay, I'm okay." Then I figured shaking his hand would signify that I'm ok, so I did so with him and his female passenger. They drove off. My stupid mistake made this poor man, who is living in a war zone, even more scared. Jesus, why the hell didn't I watch where I was going? Stupid. I climbed back into the Jeep and slapped some hand sanitizer on my leg and I was fine. General Hospital is overflowing. Relief groups like the Swiss have set up tents on the access roads. This is Bobby, patient number 109. He was grinning when we went inside, and then as I interviewed a mother whose son was injured by falling blocks, and whose other son died when the house collapsed, Bobby started wailing. You can hear his cries on my tape recorder. He started smiling again when our exec. director went over and chatted with him, and signed his cast. Then there are the tent cities. Yesterday we visited Delmas 40b. 50,000 people living there during the day, the population swells to around 70,000 at night. Yes, there are that many homeless. There's no sanitation. We supplied a water tank that's giving them thousands of gallons of fresh water, but there's no sanitation. When will typhoid set in? Other diseases? We're leaving today. Yesterday as we left the Haiti office, Karen gave me a big hu g and said, "I don't want you to go." I gave her some romance novels, and left her with my Sherryl Woods book I was reading, hell, I can't read now anyway. She kept saying, "I don't want you to go." I feel terrible for leaving, even though the logical part of me knows I have to go home and keep doing my job, tell stories to raise money to help people. But I feel partly like I'm abandoning them. I think the news crews are all pulling out as well, but for CNN. There's a CBS crew staying here in our hotel who checked in last night like we did. I doubt they were arriving, though they could be. I told Karen, "We'll be back." We will. What happens in six months when all the doctors, the kind and generous volunteers, have left Haiti? What happens six months from now when someone says, "Oh Haiti? Yeah, aren't they back on their feet yet? Why not?" What happens when the world has forgotten Haiti once more and the people are still suffering, their children not going to school, fear still etched on their faces like glass scratched by stone, still living in tents, still trying to survive? Dead bodies don't bother me. The suffering of the living does. Visiting Catherine, her sister Nathalie and their mom was the highlight of my Haiti visit. It was wonderful to see them all, and know they are doing o.k. in these tough circumstances. Then again, Catherine is one tough cookie. Their three dogs are all okay as well. Yesterday we visited another tent city, this one of about 6,000 people on the grounds of a partially collapsed high school in Delmas. Delmas had a lot of homes and buildings collapse. The conditions are brutal. People were bathing alongside the walls of the school, trying desperately for a little privacy. The bathroom is the cluster of trees ringing the open field where the tents are set up. Below the tent city are the white tents of Doctors without Borders, who have set up a field hospital here. I'm grateful I have a foam mattress. Yesterday the director of FFP Haiti got a call from one of the hospitals. They are in desperate need of mattresses for patients who have had surgery. They've had so many patients that they have to lie on cardboard on the floor right after surgery. There are no beds. Kareen sent all the hospital beds we had in the warehouse, but it's not enough. She's looking into getting more. "Can you imagine having surgery and then having to lie on the hard ground after?" she asked me. The thought really bothered her. It bothers me as well, and I feel slightly guilty about the mattress I have at the office for sleeping. I know it will go right to a hospital when I leave. I'm thinking, "Ok, how can I sleep on a mattress when there is someone in a hospital who needs it more than me?" Then I go back to being pragmatic, which I've had to be since I arrived here. If I sleep on the floor, I won't sleep and I'll be useless when it comes to doing my job while I'm here. My job is to find out what's going on, get stories of what people need and raise money so that not just one person can have a mattress to sleep on after they've had painful surgery, but everyone can have a mattress. I'm sleeping at the office mainly because it has internet, and I'm updating the FFP blog as I can, when the internet works. Also since it's our operational center, I'm right here where the action is. Every night, we drag the two mattresses from their storage place, set them on the floor of two offices, and pull out the blankets and sheets after rearranging the furniture. We use towels for pillows, though I found a pillow an employee uses for back support, and covered it with an FFP tee shirt as a pillowcase. I slept better last night, not any neck problems this a.m. At night the sound of C130's and C5's drone overhead as they make their way into the airport, which is about a couple of miles from the office. I told Ben this morning that I'm so accustomed to the sound of the generator running all night that it will be hard to sleep in the quiet when I get home. We are supposed to visit a hospital downtown tomorrow. Right now FFP is going to supply free oxgyen to all hospitals in need, and man, there are plenty. One of our employees who had set up water tanks in a few of the tent cities made the rounds at the hospitals to ask about their O2 needs. He told us the hospitals downtown are pretty bad, so that's where we are going. Ben and the guys had already visited one hospital, but we need to see another. Cite Soleil yesterday was very uplifting for me. Only two of the approximately 250 homes we built were damaged. The rest are all fine. Our school is fine as well. But there is still fear etched on the faces of the people. They are afraid to sleep inside because of the aftershocks. The photo of the tent on the street is one such case. I must confess I haven't felt any aftershocks, though there were two yesterday. Maybe it's because I was probably in the truck at the time. I don't know. Not that I want to feel any. Ben told me the morning of the biggest one, the nearly 6.0, he and the guys ran out of the offices but Tom, our video guy, opened the wrong door and ran out towards the courtyard. So Ben made sure to point out to me the exit when I arrived. I feel perfectly safe sleeping here. I have Nessie as well, the dino that Debi, one of our editors, brought me from Scotland. I decided to make her into traveling Nessie. I brought her into Cite Soleil and today I'll photograph her when we visit our orphanages. Nessie is a big, bad Scottish monster. She's my good mojo. I photographed her at our school in Cite Soleil and one of the Cite Soleil tents. They are still finding and burying bodies. Not to be crude, but the deal is you pay about $125 per body. The guys doing the recovery retrieve the body from the rubble, then find a crypt and just shove the body inside. It's bargaining, Haitian style, just like everything else. What else can you do when there are an estimated 200,000 dead and not enough crypts? Last night I dreamt last night of tornadoes, not earthquakes. Go figure. Doesn't make sense, but does anything now in this wrecked, recovering city that is still trying to bury the dead? In Haiti, "It was like I was in a bucket and someone shook it hard." I'm in Haiti and all is well. I'm sleeping at our warehouse offices on a nice air mattress on the floor, and there's electricity run by the generators, and running water and even a crude shower, so it's like a little hotel for us. The destruction is mind-boggling. Driving up to Petionville today to do a food and shoe distribution (a tractor trailer o f food and Crocs), you see one crushed building about every four blocks. Then there are buildings still standing. It's surreal, some of the buildings look as if a giant just squashed it down like a kid mashing down a sandwich and rubble oozing out of the seams. I talked with Junior, who is in charge of customs in our Haiti office, about where he was during the earthquake. He said he was outside our office and the ground started moving. "It felt as if I were in a bucket and someone shook it hard." He was relieved to find out his family was ok. I've seen all our staff I know, and they are ok, but it's numbing for them. Just trying to find everyday stuff like baby formula is challenging. We did a distribution today at a tent city in Petionville. The leader has it very organized. We delivered the food and crocs, and they are stored in a warehouse and the community leaders from each tent city take the food and supplies to the tent cities and give them out so there is no mass chaos and panic. Ken, who organized the community leaders, said there are 7 camps in this section of Petionville alone, with a total of about 20,000 people. The tent city by the airport is massive. Where there was a parking lot, people are now living. No sanitation... it will lead to disease soon. It's pretty bad. I met a woman who was terrified her two year old baby had been killed... she was in her house and the baby was at her mother's house when the earthquake happened. She ran out in the street, toward her mother's house and grabbed her baby, who was sleeping, and naked, and just ran down the street crying and praying. Later she found out her mother is okay. But the house is too damaged to live inside. She had a small meal yesterday of rice and beans and she's sleeping on the ground atop the clothing she managed to salvage from her wrecked house. There are masses of NGO's here, and press. I saw Anderson Cooper last night walking by when we were at one of the few remaining hotels in Petionville for our exec. director to do an interview with CNN Espanol. Tons of press, but I wonder when they will call it a nonstory and leave Haiti with its wrecked buildings and wrecked lives and massive rebuilding to be done. I'm glad they are still here and keeping Haiti in the public eye. Before we crossed the border, we had to get innoculated at the section the Domnican Republic military has set up a field operation. As we were there, waiting for the rest of our team, the American ambassador landed in a chopper. He's touring with USAID, an organization we've worked with before. I'm doing ok, but exhausted, both from getting my shots and from the pace and the intensity of everything. I'm so glad I came, because it's really bad, but seeing some normalcy of life returning, people selling in the streets, and buildings still standing, makes me hopeful. It's bad here, don't get me wrong. There are still bodies beneath all the rubble. So many have died, and the people here still live in fear of aftershocks. There was a small one this morning as we were leaving, but I didn't even feel it. Probably because I was in the truck and the engine was running. And it will take years to rebuild... and in the meantime, what about the kids who need to go to school? I talked with two kids today at a tent city who were in school when the quake happened. One got hurt when he tripped and fell in the panic. Their school is still standing, but it's not safe. Anyway, I have to run. I'll try to post pix later, when the connection is better. We're going to Cite Soleil today and then to our orphanages to see how the kids are faring. Just got a text from Ben, our photographer in Haiti who is on his way from the DR to Port au Prince, where our warehouse is located. They have a truck of supplies, food, meds to deliver. The Food For The Poor feeding center is open, (yay!!!) and will be open tomorrow. They expect more people as word gets out. Man, I need a new cell... trying to text on an outdated Razr is like trying to find grains of rice in a sandbox. I'm due for an upgrade, but have resisted. Think tonight I'll cave and finally buy a new phone. The Haiti quake crisis has opened my eyes to the reality of how important texting is. Food For The Poor is the charity where I’ve worked for the past 16 years as a writer. I’ve traveled to Haiti, and other countries to assess the needs, interview families and write newsletters and fund-raising materials to help them. If you are interested, you can check out the FAQ page here. If you want to help the victims of Haiti's earthquake, but are uncertain which organization to choose, how do you choose? There are lots of great charities besides my organization (International Red Cross, Doctors without Borders, World Vision, CARE, just to mention a few). Charity Navigator investigates non-profits and their finances and rates them. The highest rating, which my charity (Food For The Poor) has, is four stars. Beware of street collections and giving cash. Anyone can slap a label on a jar, put an official looking badge and say they are collecting for earthquake relief. For example, when driving to work the other day, I saw homeless people who solicit for a local homeless charity asking for donations for earthquake relief. Be cautious when giving online, especially concerning websites and new groups that spring up overnight. Is the charity is providing direct aid or are they just raising money for other groups? No matter who you chose to send your gift to, it counts. You may think whatever you can give won’t be more than a drop in the bucket compared to the needs, but consider that your drop, combined with other drops, creates an ocean. Every dollar counts. You’d be amazed at how charities can get the most bang for your buck. "Outside a warehouse, hundreds of desperate Haitians simply dropped to their knees when workers for the agency Food for the Poor announced they would distribute rice, beans and other supplies." They started praying right then and there," said project director Clement Belizaire. Children and the elderly were asked to step first into line, and some 1,500 people got food, soap and rubber sandals until supplies ran out, he said." Clement is a wonderful guy. I've traveled with him to Cite Soleil, in fact, he arranged for us to tour the slum to find stories and that's where we found a wonderful woman who had found an abandoned baby, took him into her home to care for him, got adoption papers through the police station, and despite her own poverty and her own need, treated him as her son with lots of TLC. Hang in there Clement and everyone. You've got lots of people cheering you on from the States, and I'm one. Hi everyone, first great great news, my friend Catherine Hermantin and her sister Nathalie are ok! A relative posted on her FB page that their house was damaged, but they are safe. Next, I wanted to pass along some information. I can't access my organization's blog right now, which I've been updating, but we received word from Haiti and a call for specific types of medical supplies needed. I'm hoping someone will read this, pass along the word and get donations (talking large quanties, pallets) to Food For The Poor. For those who don't know about Food For The Poor, the organization I work for, we've had a large presence in Haiti since about 1986 and have offices and a warehouse close to the airport. That area is running on generators and we are getting items out to deliver. One of our staff from Florida yesterday told us the workers loaded a 10,000 gallon water purifer to be delivered to the Red Cross. This is what we do... we not only run feeding programs on our own, and have four orphanages and an elderly home we operate, but we distribute supplies to where they are most needed. Last night I delivered all of the medical supplies and equipment we had to CitiMed hospital in Petion Ville. I am going back to the office to send a few trucks of food to the feeding centers. For more information on Food For The Poor, visit http://www.foodforthepoor.org/. You can check out the organization's finances and other info and make an online donation. Thanks to all who kept Catherine and Nathalie in their thoughts and prayers, and the country of Haiti, and all those who are helping. Still no word on Catherine, but I'm holding onto hope because communuication is so limited. Our guys in Haiti who arrived yest. have a sat phone but even the sat. phone it was heard to hear them. They said it's utter chaos there. Catherine lives in Petionville, and I'm not sure if her last email on Tuesday, two hours b/f the quake hit, was sent from her home or in Port au Prince. Petionville, where the Hotel Montana is, was hit very hard. There are tent cities springing up along the roadside, refugee camps. The stench is beginning to get pretty bad from what I've heard. Going into work with my jaw aching. Couldn't figure out why until I realized I've been clenching my teeth since Tuesday. Three hours of sleep each night, worrying, worrying. Watching the news. Hoping, praying, going into this numb kind of mood and just focusing on doing my job so I can do my job. These photos are of the Hotel Montana, the room where I stayed in March on the fifth floor. I was just there in Oct and was supposed to stay there in another week when I go to Haiti. Still have a reservation. I was watching the live rescue efforts of the Fairfax search and rescue team digging survivors out of the rubble, and it's chilling. For 16 years, I've stayed in that hotel. I never in my worst nightmares could imagine an earthquake. No warning. The second photo is the lobby area. I cannot wrap my mind around the fact that this is all gone and people are still trapped. I saw a photo of people camping out in Petionville. Please Catherine, I hope you and Nathalie are among them. This is me (on the left) and my friend Catherine Hermatin in Gonaives, Haiti, after the hurricane of 2004 when we got stuck in the lake that formed outside the city. Catherine lives in Petionville with her sister Nathalie. I think Nath works for Coca Cola in PAP. Nathalie Hermatin knows a lot of people in Haiti and I'm hoping someone has heard something. No one as far as I know has heard anything from her since the quake. She emailed me two hours before it struck, about plans to meet up for dinner at the Hotel Montana. Now the hotel is destroyed, people are still trapped inside as rescue crews try to free them. And I don't know where Catherine is. It's total chaos there. We have a team on the ground who reported tent cities popping up along the sides of the road from the airport. Buildings flattened. If you know Catherine, have heard anything, or have heard from someone who has heard anything, please, please, let me know. I've posted reports on CNN looking for her and the new Haiti earthquake FB page. News reports say it's chaos down there, no law, no order, no medical facilities. Info keeps trickling in, the rumor mill, which was always a dangerous source of information in Haiti, is going full stream. I've been trying to monitor news via FB and Twitter and news sources as well as updates from our office as they trickle in. Still no word on Catherine Hermatin, my friend who lives in Petionville. Or people I know in our Haiti office I've traveled with, or known for years. There is no heavy equipment to move rubble and free trapped victims. The hotel Montana, the hotel I always stay at when I visit Haiti, is destroyed. People are still trapped in the rubble. Here is a photo someone posted on Twitter of what the hotel is like now. If you've been emailing me, I'm fine, thank you for your concern, I'm here in the States. Please continue to pray for the people of Haiti. Please pray for the people of Haiti. The earthquake, which was a 7.0, hit the worst place it could in a heavily populated area. The devastation will be unimaginable. I just read a report that says the hotel where I always stay when I travel there was partly collapsed and 200 people are missing. Catherine, if by any chance you are reading this, please please please call Helga or text her or email me bonnievanak@aol.com and let us know you are ok. Or post a message on your FB page. Florida is experiencing its longest cold spell in a long, long time. Last night it dropped to 35 degrees. Now, in the afternoon, it's still barely 50 and the wind is blowing hard. I feel sorry for the tourists who came here thinking they'd get a nice, sunny tropical experience. Found out that Holiday with a Vampire III, my December anthology, is sold out at Harlequin. This makes two of my recent Harlequin books that sold out (Immortal Wolf is the other). Now I need to get cracking on the next book, and write, as soon as my fingers thaw. Because I haven't updated my website in a long while, wanted to keep you informed of what's going on. I won't have a book out in 2010. However, I've gotten the green light to start the next Nocturne, which is called The Shadow Wolf. If you've read Immortal Wolf, Gabriel is Raphael's brother, the one who agrees to forfeit his life should Rafe back out of the agreement to execute Emily. 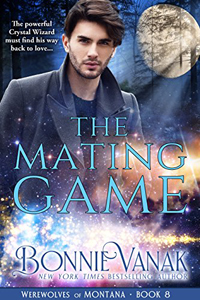 At one point in the book, Emily meets Gabe and thinks to herself that, despite his charming and friendly manner, he seems more dangerous than Rafe's other brothers, and he hides a dark secret. She's right. Gabriel is the darkest, most dangerous Draicon. I'm starting on his story this month. In other news, HOLIDAY WITH A VAMPIRE III received a very new review in the Library Journal. 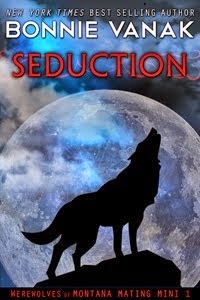 The reviewer said about my story, "Misunderstandings, family issues, and prejudice threaten to keep a vampire and a werewolf apart in Bonnie Vanak's fierce and funny 'Unwrapped.' "
Yay! My first Library Journal Review! Also, I received an unexpected surprise when I found out that Immortal Wolf has sold out on eHarlequin. It's still available on Amazon and other online sites, such as Barnes and Noble. But there are no more copies at Harlequin. So that's what's going on with me. If I have any other news to report, it will be on this blog first. With the day job, I'll be traveling to Haiti at the month's end, before elections. It's always a little dicey around election time in Haiti.